Over 5,000 Shows Since 1997! We Bring The Pianos, Sound, Lights..Everything! No Hidden Charges. The Killer Dueling Pianos provide High Energy, Crowd Interactive, Dueling Pianos, Solo Piano Bar Entertainers for Every Occasion!! We can bring a Drummer and Guitar to turn your Special Event into a Roof Raising Dance Party. If you want a Jimmy Buffet Style Solo Guitarist, we have that too!! Our Musicians are recognized Worldwide!! We also do consulting for your bar or restaurant!! Killer Dueling Pianos........Exceeds All Expectations!!!!!! Can’t say enough about Ryan Bueter and The Killer Dueling Pianos. What a Show! We recently hired them to perform at my daughter’s wedding. Ryan was very professional and so easy to work with throughout the process. Our crowd was definitely a mix of young ,old ,conservative, and wild so a traditional DJ was not going to cut it. Ryan promised a great show and WOW did he deliver.The two pianists and drummer were so unique and talented These guys can play thousands of songs , everything from the classics to today’s PoP Music and the audience requests poured in all night long. It was such a refreshing change from the ordinary wedding reception climate. Ryan was a great MC and had the perfect flow of energy throughout the entire evening. He even went out of his way to have his partner pick up an Oklahoma State University Flag and learn the Fight Song the night before the wedding after finding out that the bride, groom, and several guests were OSU Alumni. They certainly went above and beyond anything we could have imagined for our event. Thank you Ryan and The killer Dueling Pianos for making our daughter’s reception the “talk of the town”. We are forever grateful and they will be the first call we make for any future events. For anyone looking to give their guests an unforgettable experience , Ryan Bueter and the Killer Dueling Pianos is a must! 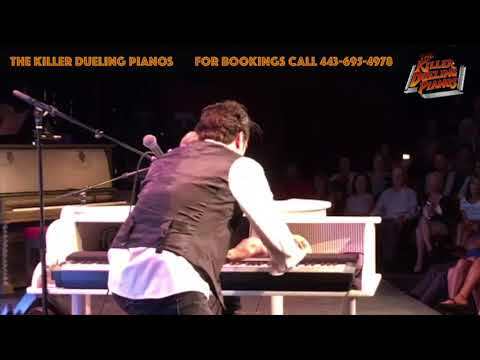 Killer Dueling Pianos - WOW! What a performance! I recently hired Ryan Bueter and the Killer Dueling Piano's for our corporate Holiday Party held at the Marconi Automotive Museum in Tustin Ca (Dec 2014). I personally requested a HIGH energy performance that was as crowd engaging as you could get, and I got exactly what I asked for! Ryan was extremely easy to work with, both he and his partner were extremely professional throughout the entire process! If you are looking for an alternate to the "standard DJ, or band" (let's face it, it takes too long to get people dancing at corporate events) HIRE these guys! You WILL NOT be disappointed! Ironically, EVERYONE loves to sing and whether our guests were sitting at their tables or standing around having cocktails, really got everyone going, requesting songs, singing on stage with them and DANCING! Good times! LOOK them up! I will definitely be in touch with Ryan for other events, both personal and professional! Thank you so very much Kim! We had a great time as well an look forward to working with you again! The Killer Dueling Pianos Are Awesome ! Hired the KILLER DUELING PIANOS for a surprise 50th birthday party for my wife. Could not have been happier. Ryan and Liz were extremely professional. They both had a great feel for the room ( ages ranged from 16 to 75 ) Both are great entertainers and musicians, who never let the party fall into a lull. Their vast knowledge of music from many different decades and many genres kept everyone happy. The only people who were disappointed were those who missed the party and have continuously heard how great it was from those in attendance. Will definitely be hiring the KILLER DUELING PIANOS again. Each year our school, Amelia Earhart Elementary, hosts a fall gala. We are always trying to make it bigger and better. This year we hired Ryan and the Killer Dueling Pianos and it was a huge success. The Killer Dueling Pianos entertained the crowd from start to finish and the post event feedback has been phenomenal. We plan on bringing them back for future shows. Amazing night with amazing people! Stop looking.... seriously. You've found the band you need! We had the Killer Dueling Pianos at our wedding in May, 2015 and we could not have asked for a better band to play. There are not enough stars here for me to tell you how well this all worked out. From the simple contract, to the constant communication and professionalism, Ryan and his pianists have this down pat. We did not do much practicing for our wedding but Ryan stepped right up to MC our wedding and play transition songs to keep the flow. We never asked for this but he knew exactly what to do. Weddings can be tricky sometimes to keep people dancing, however we have known one of the pianists for quite some time and we knew we would never have a problem with that. They kept the crowd engaged at all times and it was all smiles. Some people have said this is very unconventional to have at a wedding but having a DJ at our wedding seemed like the most boring thing we could have. This was definitely the best option! Stop looking, you've found the band you need. Thank Marcus! You and Kate were an awesome couple to entertain for and I'm honored that we could be part of the most important day of your life! see you soon at THE PUB! Ryan and Lee of the Killer Dueling Pianos exceeded our expectations. Ryan was very prompt and professional from the initial phone calls/emails when we set up the event all the way through to the end of the performance. Their equipment/pianos looked and sounded great. The guys were true entertainers and made for a great party that everyone enjoyed with our patrons ranging from the early 20s to the late 60s. I don't normally write reviews, but these guys deserve it. I would certainly recommend them to anyone looking for great dueling pianos. These guys could handle very large events all the way down to private parties. Thank you very much Bob! We had a great time as well! The Killer Dueling Pianos were so great to work with from my first contact with Ryan Bueter. He was professional and extremely knowledgeable about what I wanted and needed for a very special Jack in the Box Corporate event. The night of the event was flawless thanks to the great entertainment..................I would highly recommend The Killer Dueling Pianos for ANY occassion! I've been to many piano bars and seen countless piano shows over the years, so when I needed entertainment for my company party, a dueling piano show was a no-brainer. The Killer Dueling Pianos came highly recommended, but I tried not to get my hopes too high, having been disappointed by other dueling shows. I needn't have worried, though, as KDP not only met but surpassed my expectations. This was without a doubt one of the best piano shows I've ever seen, and some of the finest entertainment that there is. The Killer Dueling Pianos impressed me with their expansive playlist and musical talent, but even more so with the players' ability to read and react to a crowd, changing course a moment's notice if necessary. Ryan Bueter also displayed the best comedic timing I've ever experienced at a piano show (or at most comedy shows, to be honest). Additionally, the outstanding level of professionalism, organization, and integrity that KDP brought to the table made the entertainment portion of my event the one part that went off without a hitch or a headache. I cannot recommend the Killer Dueling Pianos highly enough, and I'm looking forward to the opportunity to work with them again. The best thing about The Killer Dueling Pianos is that these people do not stick to a formula. They play for the audience, and they know how to read the crowd. On any given night you can get a rap about Green Eggs and Ham, a mash-up you would never expect, a bawdy song delivered in such a way that it will have your customers and staff laughing so hard they're crying, or a blushing bachelorette sitting on a piano bench laughing and blushing at the same time. The professionalism an impressive catalog of music that The Killer Dueling Pianos bring to the table is only rivaled by their instinctive knowledge of people and how to best handle any given situation. I never expected to hear "Anegada Da Vida" at a piano bar, but a bachelorette's father (who was the big spender that night) requested it, and Ryan Bueter delivered in no time at all. All in all I was blown away. Thank you for the kind words Erin! An absolutely unique and awesome show! Thank you Tara!! Glad we could deliver!! Quality Entertainment Custom Tailored for Your Special Event!! If there's anything Specific we can do for you, please don't be afraid to ask!! The Killer Dueling Pianos is owned and managed by Ryan Bueter. Ryan has been performing dueling pianos for 20 years around the world at over 30 clubs including the famed Harrah’s and New York, New York casinos in Las Vegas as well as a guest piano player on occasion for Gilby Clarke of Guns-N-Roses fame. Having been in the business for 20 years, Ryan has built a network of fellow Piano Bar Entertainers, and only employs those that he considers World Class to be part of The Killer Dueling Pianos Team!! 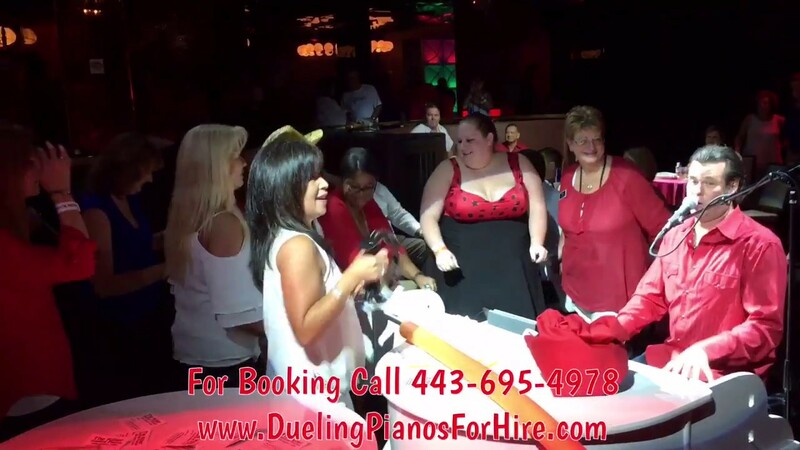 Whether you want us in Tuxedos or Dressed For a Night on the Strip, The Killer Dueling Pianos will bring you High Energy, Crowd Interactive Entertainment, with a Quality that can't be matched, Custom Tailored for your Special Event!! We will have your party guests singing along, clapping along, dancing along….and talking about your event through the next year!! We can even bring a drummer and guitars and go from a Sing-A-Long Dueling Piano Show to a Dance Party into the late hours! We also Provide Solo Piano Players for every occasion as well, Classical, Jazz, Weddings,Etc..
We are self contained and can bring the pianos, necessary sound, and lights while all you need to do is enjoy the party!! 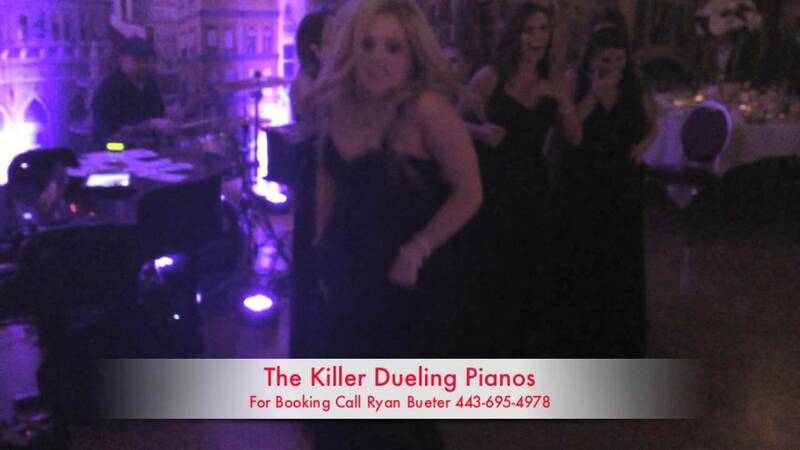 Call Ryan from The Killer Dueling Pianos today, and get your Party Locked Down!! Depending upon location, We can Usually Provide all equipment needs to the pianos, lights and sound. On Some Occasions, Extra fees for travel and hotels may be negotiated.